Joint and cartilage issues are very painful and debilitating. Athletic injuries, accidents, and age related joint/cartilage issues have one thing in common…pain and disability. Prescription pain relievers give some temporary relief, but rarely solve the root problem. 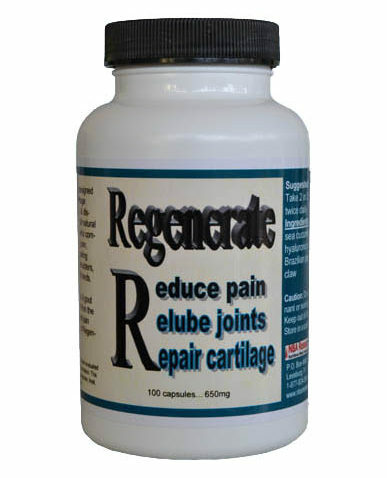 To restore function and permanently resolve the issue, the joints and cartilage must be regenerated. That is the intended function of Regenerate R. The carefully chosen natural ingredients work synergistically to nourish and regenerate the afflicted area. Used in traditional Chinese medicine to treat a number of health problems, including fatigue, impotence and joint pain. Sea cucumber contains high levels of chondroitin sulfate, a major component of cartilage. Contains natural anti-inflammatory compounds. Sea cucumber is rich with niacin, calcium, ta-urine, lysine and other elements to restore brain fatigue and improve memory. Sea cucumbers provide vitamin A, B-1(thiamine), B-2(riboflavin), and B-3(niacin), and vitamin C as well as the minerals Calcium, Iron, Magnesium, and Zinc. Curcumin…is a substance in turmeric, that seems to reduce inflammation. Several studies suggest that it might ease symptoms of osteoarthritis and rheumatoid arthritis, like pain and inflammation. In lab tests, curcumin seems to block the growth of certain kinds of tumors. One study showed that turmeric extract containing curcumin could — in some cases — stabilize colorectal cancer. Other preliminary lab studies suggest that curcumin or turmeric might protect against types of skin diseases, Alzheimer’s disease, colitis, stomach ulcers, and high cholesterol. Curcumin is and anti-imflammatory and an anti-oxidant. Curcuminoids support important blood and liver functions, healthy joints, and your overall well-being, which in turn helps promote radiant and supple skin. anti-cancerous, anti-viral, anti-candidal, anti-bacterial, immune stimulant. as a heart regulator & mild hypertention to stop bleeding and treat wounds internally & externally. Hyaluronic Acid … benefits our joints in the same way as the oil in your automobile engine lubricates the moving parts. Our body produces hyaluronic acid naturally, but as we age our body produces less and less hyaluronic acid. Its function in the body to lubricate movable parts of the body, such as joints and muscles and to lubricate your skin. The loss of hyaluronic acid in the skin cells is the reason for sagging and wrinkled skin. Hyaluronic Acid is critical for all bones and cartilage structures throughout the body. Our joints are surrounded by a membrane called the synovial membrane which forms a capsule around the ends of the two articulating bones. This membrane secretes a liquid called the synovial fluid. Synovial fluid is a viscous fluid with the consistency of motor oil and is mostly made up of hyaluronic acid. It has many functions, but none more than providing the elastic shock absorbing properties of the joint. Its second most important function in the joint is to carry nutrients to the cartilage and to also remove waste from the joint capsule. an anti-inflammatory for arthritis & muscle pains, strains, & injuries. immune stimulant & reduces side effects of chemotherapy. for Crohn’s disease, colitis, diverticulitis, & irritable bowel syndrome. for stomach ulcers & ulcerative colitis and as a ulcer preventative and bowel protector.